The koala is an iconic Australian marsupial. Cute and soft, it was inevitable it would be made into soft toys! Australia's 'bear', the koala became a popular subject for toys in the 1920s. 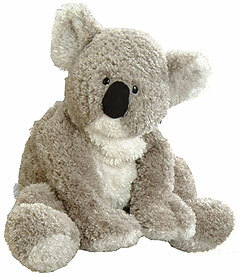 The first soft toy koalas were made of koala, wallaby or kangaroo fur, with jointed arms, legs and head. Eyes were made of leather shoe buttons with a pure rubber nose. These noses have tended over time to become hard and brittle. Claws were leather. These toys are comparatively rare and highly collectable. Stuffed with woodwool, they have also become a favourite with insect infestations! Koalas also became a very popular and fashionable trend during the 1920s. A wide range of koala merchandise was produced, not just for children but also for women and the home. These included koala tea cosies, muffs, purses and handbags! Each was also made from the same materials as the soft toys-fur, shoe buttons and leather. Knitting patterns for tea cosies offered another alternative for the home! Many commercial teddy bear manufacturers also made koalas in the range. 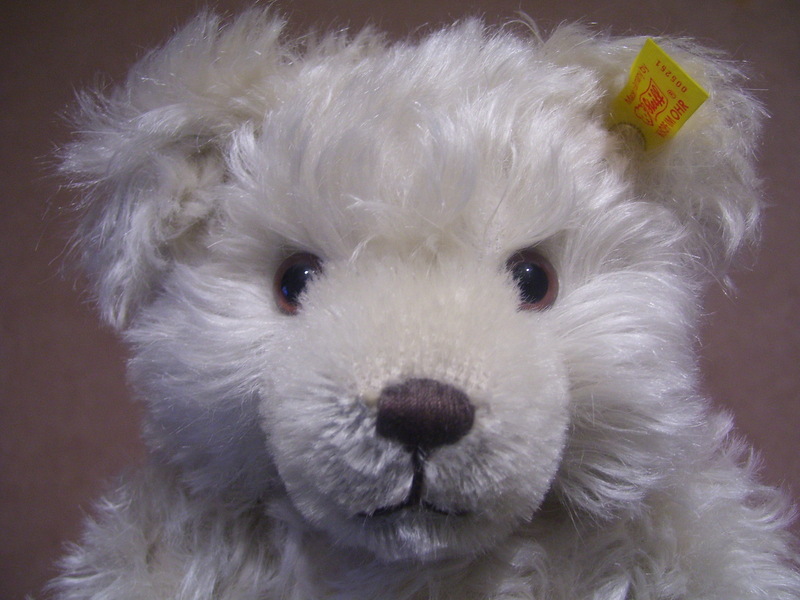 Steiff, the famous German manufacturer, as did Deans in England, and others around the world, produced mohair versions with glass eyes, and stuffed with woodwool. Koala toys continued to be popular. Generally they were now produced from kangaroo fur, but were often no longer jointed, having a fixed head and limbs. The arms and legs were outstretched in a 'starfish' shape, and still with shoe button eyes, and leather claws and nose. Sheepskin versions were also made, also with these features, and stuffed with woodwool. Koalas made their way into popular children's literature at this time, such as Blinky Bill! The koala toys of this period now had glass eyes and had leather noses, though increasingly synthetic rubber was used. Kapok or a kapok-woodwool blend was used as the stuffing. The shape remained the same as earlier versions! Unjointed, with outstretched arms, they continued to be able to sit on their bottoms unaided. Glass eyes were now used, with kapok as the stuffing. These koala toys, made from kangaroo fur, tended to be lighter in colour than the very early ones, of wallaby, rabbit or koala fur, which were longer and darker. A common problem with the kangaroo skin toys is thinning of the fur and bald patches. This could have been due to problems in the tanning process. Koala toys were still made from kangaroo skin, with synthetic rubber noses and claws, in the starfish shape. Kapok-filled, they needed to comply with new safety regulations and therefore to have plastic safety eyes. Increasingly, though, the koalas were made from synthetic fur, as public condemnation of the use of animal fur increased. Koalas continue to be most popular as souvenirs of Australia, by overseas tourists. One of the earliest and most prolific companies responsible for their production is Morella. Morella was, and is, largely known for its tourist trade toys. Morella started making its range of fur souvenir koalas, kangaroos and teddy bears in the 1930s. Made from wallaby or kangaroo fur, these early toys were filled with cork or woodwool, and later with rubber or flock. Paramount had a popular range made from rabbit fur, during the 1950s, and examples with tags can still be found. Many other companies continue to also include koalas in their range. The appeal of the koala ensures it will remain a popular toy! Most early koalas are unlabelled. Values given show the range from that expected at a market, to that in an antique shop or fair. Jakas began production in 1954 in Melbourne by Marion Stanford, reaching its peak in the 1960s-80s. Sought-after, Jakas teddies are very collectable. The earliest Jakas bears are comparatively rare. Made from mohair, they were fully jointed and stuffed with kapok. With glass eyes, these bears were good quality but often unlabelled and so harder to attribute to Jakas. Production of these mohair bears was short-lived, as a changing market favoured a different type of teddy. The 1960s saw many changes in society that reflected in the teddy market. Technology advanced and consumerism rose! Toys became much more plentiful as industry re-established itself after WW2, and new fabrics were invented. Synthetic fur and plastic joints could now be used. Prices for these were lower than traditional methods and so teddy bear prices dropped. Cheaper goods were more popular! The influx of cheaper Asian imports also pushed Australian manufacturers to reduce costs and to use cheaper alternatives. New stringent safety regulations meant glass eyes could no longer be used in children’s toys. Jakas introduced a teddy design that was to become their trademark ‘look’ for the next thirty years. 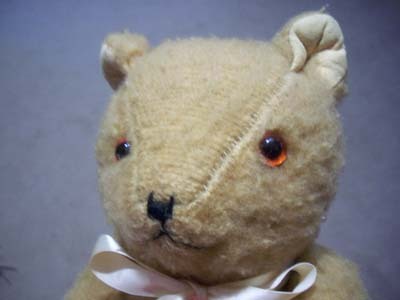 With plastic eyes, some being two-toned (brown with black pupils) and black embroidered nose and almost horizontal mouth, each teddy had a distinctive ‘Jakas’ face. As did other companies at this time, such as Joy Toys, Verna, and Wendy Boston in England, Jakas bears were now made of synthetic fur, with arms outstretched, though Jakas teddies have their arms curved upwards. Pads (of the same fabric) each had three black thread claws. Distictively, also, the hips were unstuffed, so as to allow teddy to ‘sit’. Stuffing was crumbed foam rubber. A large range of toys was made, all with the typical Jakas face, including bunnies, dogs, baby walkers and pre-walkers, (which were wheeled toys with a handle for the child to push it along with, such as teddies, dogs, horses), and pyjama cases with a strong metal zip underneathe that allowed pyjamas to be stored within the case (cats, dogs), dolls with vinyl faces and plush bodies, and golly wogs with velvet faces, red cotton pants and cotton check ‘shirts’. Teddies were made in many sizes, often golden or light brown. The most famous would be ‘Big Ted’, immortalized for 45 years in the ABC children’s show ‘Play School’. 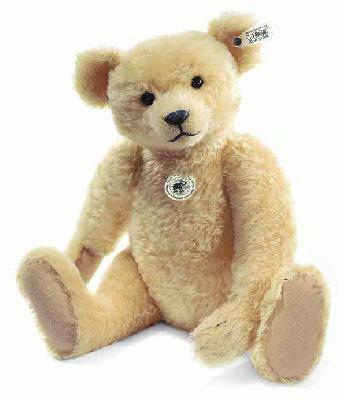 Generations of Australian children have grown up with this well-known Jakas teddy bear! Jakas continued to produce an extensive range of soft toys, with the “Jakas’ face. The fur of 1970s-90s teddy bears was fluffier, but with the same shape. Stuffing was now polyester wadding. Jakas remained in production after all the other major Australian manufacturers of its time had ceased producing toys, due to the competition from cheaper imported Asian toys. In 1989, though, this most prolific company was taken over by Wendy McDonald, merging with another company, Koala Mate. The combined comapny now produced limited editions. One range was a limited edition fully jointed teddy, made from wool plush, and with a large black embroidered nose. With large cupped ears, short limbs and velvet paw pads, it did not resemble the traditional Jakas bears! With their sweet faces, Jakas teddies and soft toys are highly collectable and very popular. The lower prices given reflect those that may occur in a market situation, up to those expected in an antique shop. In 1920, Daphne Milne bought a large mohair teddy bear for her one year old son, Christopher, from the famous London department store, Harrods. As the English firm of JK Farnell was the exclusive supplier of teddies to Harrods, it is most likely that Farnell made Winnie-The-Pooh. There would be many other similar bears around the world! A big family of “Poohs” under different names! Christopher first named his teddy ‘Edward Bear’, but renamed him “Winnie” after an American black bear he loved to visit in London Zoo. Donated by a Canadian, Lieutenant Harry Colbourn, Winnie had been bought as a cub from a Canadian hunter during WW1 and bought to England when Lt Colbourn’s army unit was enroute to France. She stayed at the zoo during the war but remained there for the rest of her life, having become a favourite ‘friend’ to visitors. ‘Pooh’ was a swan that the Milnes visited in the English countryside, and of whom Christopher was very fond. Winnie The Pooh became a character in the family’s social life! Christopher personified his bear with conversations, which with other animals from his nursery, became characters in a series of little incidents that Mr and Mrs Milne, and their friends, enacted for a laugh! These other animals included a donkey (a Christmas present to Christopher, named Eeyore), and a piglet (a gift from neighbours in Chelsea). ‘Tigger’ the tiger, ‘Kanga’ and “Roo’ were also added in 1925 and 1926. These incidents inspired AA Milne to bring them to literary life in his poems and stories. He set these stories in Ashdown Forest, Sussex, a mile from a country home the family bought; the ‘Hundred Acre Wood’ was based on the ‘Five Hundred Acre Wood’ within the forest. Christopher Robin himself though, pointed out that he believed his mother provided his father with much of the material for his books, as it was she who predominately played with him, and relayed the stories of their play to his father. Edward Bear first appeared in a poem in ‘When We Were Very Young’, published in 1924. Pooh the swan was also a character in this book of verse. The London Evening News, though, published a story in Dec. 1925, in which Milne had used Christopher’s new name for his bear, for the central character, Winnie The Pooh. His first book about the teddy, ‘Winnie The Pooh’ was published in 1926 by Methuen, starring ‘Winnie The Pooh’ in a collection of stories. Will The Real Pooh Bear Please Stand Up? Ernest Shephard illustrated ‘Winnie The Pooh’, and it is his lovely line drawings that became the original image that readers knew to be Pooh. He didn’t, though, base his illustrations on Christopher Robin’s bear, but on his own son’s teddy, named Grisly. On June 16th, 1961, Disney acquired the rights to Pooh. In the three subsequent years the Disney animators rewrote and redrew the Milne books producing ‘Winnie The Pooh And The Honey Tree’. Unfortunately, all traces of Pooh’s British heritage were meticulously erased. Christopher Robin was considered too ‘sissy’. Lyrics were reworded by the Sherman Brothers. The character image of Pooh readily available today is a variant of that created by Disney. Originally Pooh’s name was hyphenated (Winnie-The-Pooh) and these were dropped. ‘Gopher’ replaced ‘Mole’, so as to be more familiar to American children. It is a thought though that being presented with ‘exotic’ new animals and foreign accents would have added to the enchantment of Pooh and his world. In 1947 AA Milne agreed to allow the toys to tour the US, arranged by the US publishers of his work, Dutton Publishing. The tour lasted ten years, before Dutton convinced Milne to allow the family of toys to remain in America. As of Sept 11th, 1987, they now reside in a large glass case in the New York City Library. Roo, though, disappeared in Sussex before the tour, probably taken for a ‘walk’ by the family dog! It is uncertain whether the toys will ever travel back home to The Hundred Acre Wood and to Christopher Robin. Christopher distanced himself early on from the glare of the world’s spotlight, and ran a small bookshop in Devon, in country England. In 1952 he wrote two autobiographical works, ‘The Enchanted Places’ and ‘Path Through The Trees’, the process of which helped him to feel more at ease with his fame. He died on April 20th, 1996, aged 76, after a long battle with myasthenia gravis, an autoimmune neuromuscular disease. The first teddies appeared on the world market in 1902/3. It was only after WW1 when Australia began to be less reliant on imports and manufactured more products, that teddy bear production officially began.Joy Toys in Melbourne (1923) and Fideston in Bunbury, WA, were the first significant producers of teddies in Australia. Fideston commenced business as a book and music store in Perth, by Richard and Louise Fiddes. In 1921 the Fideston Toy Company was registered. It brought out a range of high quality teddies and other soft toys, with over 1,000 teddies being hand-made per month! As these toys were not labelled with tags, they are usually identified by the cone-shaped muzzle, broad head and triangular (split-leather) paw pads. With high-quality glass eyes, long silky mohair and woodwool stuffing, Fideston bears are relatively rare, and valued by collectors. The firm closed down during WW2 after nineteen years of production. Lindee was situated in Sydney, and was a prolific manufacturer of toys from 1944 to 1976, owned by Mr and Mrs Lindenberg. It is well-known for its range of lovely dolls, soft toys and gollies, as well as its bears, made from English mohair, with vinyl paws and glass eyes. With larger rounded heads and cotton flock stuffing, these bears resemble English teddies of the same period. Crumbed rubber was used as stuffing in the 1950s. The distictive Lindee embroidered tag of a sitting fawn and the words "Lindee Toys/ The Prestige Name In Soft Toys" was sewn into the paw pad, though the distictive square muzzle of Lindee bears helps to identify unlabelled examples. The business was sold in 1969, but continued to produce bears, of a lesser quality, for the next seven years. 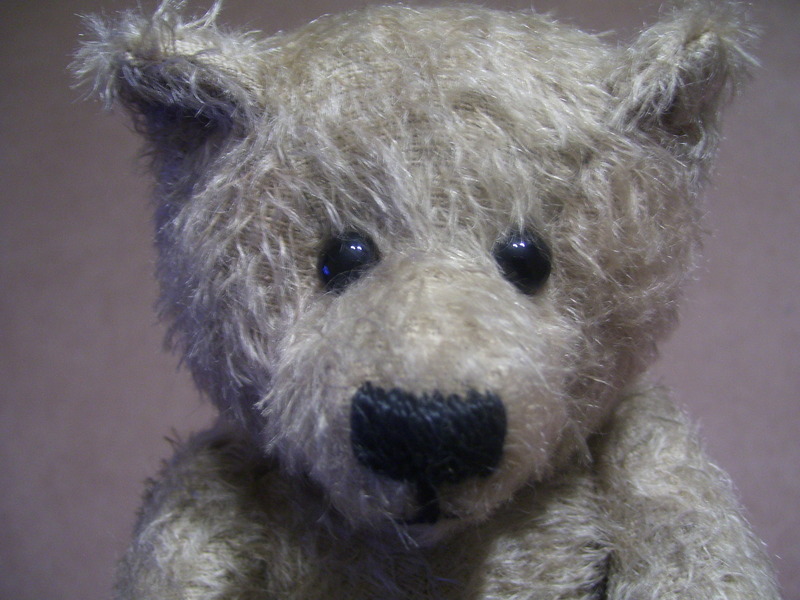 Emil, from the 1930s till the mid 1970s, produced its teddy bears from several factories in Melbourne. Early bears were made from imported mohair, with pads of oilcloth, and had tapered front paws. Eyes were glass, and bodies filled with excelsior and kapok. The noses of Emil bears help to identify them, having two outside stitches longer than the inner stitches. 1950s bears often have vinyl pads, lesser quality mohair and stiff necks. With their sweet look, Emil teddies are highly collectable. Berlex began in the early 1950s. Lex Bertrand commenced his company making golly wogs, bears, soft toys and dolls of high quality. The bears were made from the best mohair, with white leatherette or vinyl pads and a distictive stitched triangular nose. Berlex teddies often have a rounder, sweet face. Verna-the Verna Toy Company began production in 1941 in Victoria, as a doll maker. After ownership changed in 1948, teddy bears were also produced. With a distictive blunt muzzle, early bears were made from mohair, fully jointed, and stuffed with woodwool. Later versions often had a kidney-shaped piece of felt attached over the nose, Foam rubber was used as the stuffing after 1960, when eyes became plastic and pads were made of vinyl or the same fabric as the body which was made in the unjointed starfish shape. Barton Waugh traded from Hurstville in Sydney from the 1950s to the late 1960s. Named "Bruno", the bears had large square-shaped heads and small ears. Pads were brown leatherette. The mohair used was of inferior quality and as such, most Brunos are now bald! Jakas was the last major producer to close, in the 1990s. Jakas was based in Melbourne, since 1954. One of the most prolific makers, it produced a huge range of soft toys. The earliest bears were made of mohair and fully jointed, however from the 1960s the distictive outstretched arms were made in synthetic fabrics, with safety eyes, crumbed rubber filling, and machine washable. 1960s bears have the tag "Jakas Toys/Wash In Lukewarm Lux". Later versions say "Jakas Toys/ Made In Australia", and were made in many wonderful clours. Morella was, and is, largely known for its tourist trade toys. Morella started making its range of fur souvenir koalas, kangaroos and teddy bears in the 1930s. Made from wallaby or kangaroo fur, these early toys were filled with cork or woodwool, and later with rubber or flock. 1930s and 40s toys had shoebutton eyes, with rubber noses and leather claws. From the 1950s the eyes were glass and the claws rubber. Only in the 1930s were they fully jointed; the arms outstretched version began production in the 1940s. With the lifting of tariffs on imported toys in the late 1960s and early 1970s, most Australian makers could not compete with the cheap Asian imports, and closed their doors. Artist bears, exported worldwide, now showcase Australia's quality bear making. The oldest and most prolific of the Australian soft toy manufacturers, Joy Toys is known for its quality. Highly sought - after by collectors, Joy Toys teddy bears command high prices on the Australian market. The teddy bear industry began in Australia in South Yarra, Melbourne. Joy Toys commenced business in the early 1920s, as teddies became popular, and as WW1 meant a ban on teddies being imported from Germany, and disrupted shipments from Britain. Established by George Kirby and his wife, the company flourished. The earliest bears produces were fully jointed, from fine quality English mohair, stuffed with wood wool, and had twill pads with four foot claws. Eyes were glass, of the best quality. As German bears had been the predominant imports, these early Joy Toys bears resembled German bears. The company continued its success, with the bears becoming distinctly Australian in appearance, but with British characteristics. Necks became immobile, and arm pads were tapered and made of cotton, including twill. The distinctive Joy Toys nose appeared, in which an outer stitch on each side was extended up, and with a "Y" shaped mouth. Kapok ( soft, silky fibre from the seed pod of a tropical tree) was used as the stuffing. 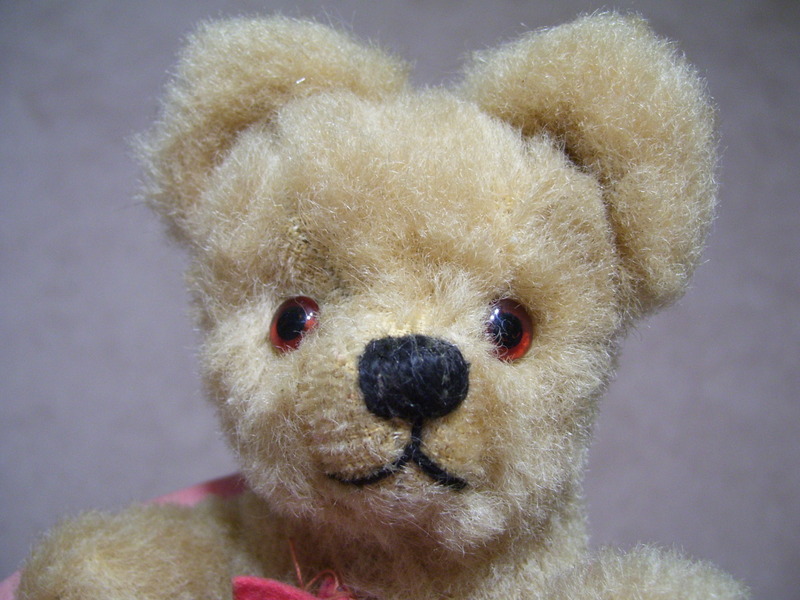 Often the eyes are missing from these early bears, which appears to have been a fault in the production. In 1935 Joy Toys acquired the licencing rights to produce Walt Disney character toys and this helped the company to grow. Mickey Mouse was a popular toy, with pie-crust eyes, and similar to the original rat-like "Steamboat Willy". In 1946 the British firm of Tri-ang took over the Joy Toys Ltd firm in Whangerie, N.Z. Tri-ang was originally founded by the Lines Brothers in 1850, and which also owned Pedigree. Dolls were produced, often of felt with buckram (cloth mask) painted faces. Good examples still exist though they are a favourite with moths and so some damage is usually present! Joy Toys teddies of this period often display a distinctive smile! Happy bears are appealing and sell well! In the 1950s they had jointed (though stumpier) arms and legs, made from mohair/synthetic plush, velveteen or, later in the 60s, synthetic plush. Paw pads were often from a similar fabric, sometimes reversed. Crumbed rubber was also used for stuffing during this period, which deteriorated over time and so many of these bears have an unfortunate lumpiness! During the 1960s, with the introduction of machine washable synthetic materials, the company developed a distictive unjointed teddy, with outstretched arms and straight legs. Pads were of a similar fabric. The same sweet smiling face, glass eyes and embroidered nose and mouth, could be seen in a range of animals that were also produced, such as pandas and dogs. Stuffing was plastic foam moulded into the shape of the body. Golliwogs were made at this time, with smiling vinyl faces, short fuzzy black hair, cloth bodies and jacket "tails". These toys are highly sought-after. Another distinctive toy of the 60s and early 70s was the long-legged range. These included golly wogs and poodles. Each "stood" three feet tall with long dangly arms and legs. Stuffed with foam, gollies had flat cotton faces, whereas poodles had shaped faces, curly "hair' and a tail. In 1966 Lines Bros (Tri-ang) took over the company, though it continued to operate under the Joy Toys name. Teddies produced in the early 1970s were of the unjointed shape. Produced from synthetic materials, they still generally had the beautiful glass eyes that Joy Toys was renowned for. 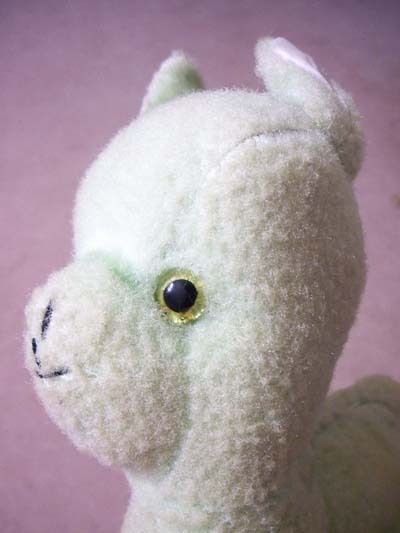 A vast range of soft toy animals also continued to be manufactured at this time, including giraffes in various sizes, dogs and cats. Giraffes, as they had been since the 1950s, were made from artificial silk plushes, giving them a lovely satiny sheen. In the late 1960s, and into the early 1970s, tariffs were removed by the Australian government on imported toys. Consequently, the market was flooded with cheap imports from Asia. This made it impossible for Joy Toys to compete successfully. After attempting to stay in business with a range of cheaper quality toys, it closed in 1976. The labels attached to the toys varied according to when they were made, though the time periods given are approximations. 1920s-40s-green embroidered "Joy Toys/Made In Australia" on white cotton label. 1950s-early 60s-green printed "Joy Toys/Made in Australia" on white cotton label. 1960s-70s-red or purple printed "Joy Toys/(Made In)Australia" on white label. Occasionally labels simply said "Made In Australia". Swing tags accompanied each toy, though these are now hard to find intact. Value depends on many factors, including the generally accepted market determinants: rarity; age; condition; and appeal. The increasing use of the internet has affected values in recent years, as it has opened up the global market to buyers and sellers. Many prices have fallen, whilst others have remained steady. The following prices are an approximation only, and reflect the differences in values from those expected at a market, through to those expected at auction, private sale or antique shop. How To Know When Teddy Is Faking It! Collecting old teddies has become a very popular hobby or investment. As prices for the rarer bears has increased, so then has the number of fake bears on the market. These teddies are made to look “old”, with the characteristics of body shape and style of antique bears, with added dirt, “worn” areas or fabricated “provenance”. These bears are then deceptively promoted as being “old”, and therefore far more valuable. Teddy might be pretending to be old before his time! Also, vintage bears that are damaged in some way or have other flaws may have these deliberately hidden, and so may not be what they appear to be. Reproductions are, however, created by many bear artists, which are recreations of earlier styles. These bears are a quality collectable for their look, and are not misrepresented as antique. Not all teddies are as sweet as they seem! The more you know, the better you are able to spot a fake. Sometimes stall holders or auction houses genuinely believe their fake bears are the real thing so it helps to know as much as you can. Read books, attend collectors’ fairs, visit antique shops-handle the bears, feel the fur, squeeze the limbs, even smell them! Experience with the old teddies helps to guard against paying high sums for a furry fraud. The more an old bear is worth, the more it is likely to be copied and faked. Those from particular manufacturers are more valuable than others. Early Steiff teddy bears have reached six figure sums at auction. Limbs on the fake bears are made long, but not the correct shape. Pads may be made of leather, though Steiff didn’t use it. They tend to have boot button eyes and a long shaved snout. Areas of fur are filed away and dirt added to appear “worn”, but invariably not in the way that a century of life would have done to a bear. The fabric used in fakes is often cotton velour and not mohair, and is distressed in areas to “age” it. The “dirt” added is not dust, as would accumulate on an old bear, but is grease-based, so as to stick to it. Occasionally modern replicas made by the defrauded firm themselves, are distressed to create the appearance of age. The fur is dirtied and new labels removed. Artificial wear is created under the arms and between the legs. The texture and feel of the fur is not that of an antique bear, and is where having handled old bears becomes important. Often, paw pads have been replaced, as the felt they were made from did not wear well. Check for stitches around the outside of the pads, and fabrics that do not match the age of the bear. Old knitted “home-made” clothes may have been added to give teddy that “been in the family for years” look! Sometimes the old clothes and other accessories such as lace, hats or jewellery are used to hide or detract from damage to an old bear, or to make it seem older. Damaged bears are often repaired and sometimes not very sympathetically! Features to check include if the eyes are the correct type for the age of the bear, or if the nose has been replaced. The nose shape can often identify a bear as many makers used distinctive shapes. Does the teddy bear have a crunchy feel, to indicate he is stuffed with wood wool, as the earliest bears were? After WW2, kapok was also used. Other forms of stuffing were not in general use early on, and could indicate if a bear is a fake. Over-stuffing may also be an indication of fraud. When Margarete Steiff first made her jointed bear toy she could not have envisaged the universal appeal of what was later to be known as the Teddy Bear. Someone to hear your thoughts, and hold your love, the teddy bear’s value has gone beyond that of other toys. Early Steiff bears, as do those of all of the major makers, including Merrythought, Schuco, Joy Toys and Chad Valley, now command high prices. 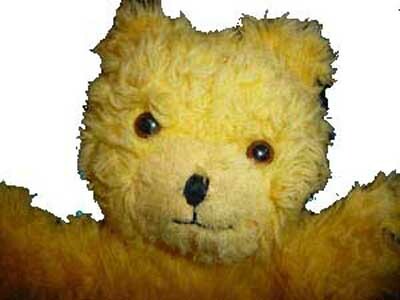 From the early 70’s when these bears could still be bought for small sums, examples have now sold for six figures! Knowing who and where the love came from adds greatly to value; provenance pays! The tiny scruff known as the Titanic Bear, who went down with the famous liner, is worth many times his mohair weight in gold! The market for old bears is determined in part by the usual determinates of value-rarity, quality, brand, and visual attractiveness, but whereas condition is an important factor for other collectables, teddies battered by years of loving are still loved by investors and collectors! Battered bears pull at heart strings and pull open purse strings! With makers located in most countries, the internet has opened up a world of access for collectors. On-line auctions have allowed buyers and sellers to meet in a global market.Â Provided Customs officers appreciate the wear and tear of affection that teddy bears, that his worn torso does not harbour illicit drugs, nor his straw stuffing a home for crop-infesting pests, then the collectors’ passion can defy the notion that money can’t buy love!